Fiddlehead ferns, so named for the shape they grow into, are a delicious addition to your spring vegetable repertoire. Similar in flavor to asparagus, with a slightly bitter finish akin to broccoli rabe, they have a wonderful texture and bite to them and have become something I look forward to each year. Before you dive head-first into a patch of sprouting ferns, there are a few bits of information that will be beneficial to you. Some fiddlehead ferns are classified as 'toxic' and supposedly the ostrich fern is the least so. The general consensus is that they can cause gastrointestinal upset if too many are eaten. I haven't had problems with them, though, so I feel that the ostrich ferns are just fine. Go easy if you're trying them for the first time just to be on the safe side. One thing you don't want to do is forage for them yourself unless you are very skilled at foraging. Look at Whole Foods or local farmers' markets during the month of May and you will likely find decent specimens. They can sometimes come with a sort of covering on them that resembles very fine garlic skin, but brownish in color. Simply give them a good rinse in clear water and you should be good to go. Although they can be eaten raw in salads, I've not done so, preferring the change of texture once cooked. If you boil them, do so for 5 to 8 minutes only, any longer renders them mushy and flavorless. I like them sauteed in butter and garlic with a bit of sea salt and a squeeze of lemon juice, but I've also had them in a quiche with ham and cheese. Gently coddled by the cooking egg and cream, they are kept from overcooking and still have a nice crunch not unlike that of a lightly cooked fresh green bean. Beat milk, cream and eggs well. Add salt, pepper, garlic and onions. Sprinkle half of the cheese in the bottom of the pastry shell. Arrange fiddleheads and ham over the cheese. Pour in the egg mixture, add the remaining cheese, and grate fresh nutmeg over the top. Bake at 375 degrees F for 30 minutes, or until a knife inserted in the center comes out clean. Whatever you do with them, don't limit yourself - they are really something everyone should try once and I promise you it's worth it. Baby bok choy is the smaller and more tender version of regular bok choy. It cooks quickly and does not need to be separated or chopped to cook. Orange, soy and garlic combine in a delicious sauce that coats pork chops and baby bok choy perfectly. If baby bok choy is not available, use the more mature version and cut into large chunks. Serve alone or with rice or rice noodles. 1. Combine flour, cornstarch and salt in a shallow bowl. 2. Heat oil in a skillet over medium-high heat and add chops. Brown chops for 6 minutes per side and set aside. 3. In the same pan add garlic, soy, juice and zest. Simmer for 2 minutes and add bok choy to pan. 4. Cook for another 4 minutes and push to the side. Add chops back into pan to coat with sauce. 5. *Optional* Serve with rice or rice noodles. **Note: Any citrus will yield more juice if you first roll it back and forth, using medium pressure, on a firm surface. By the time my kids walk through the door after school, they are nearly zombies owing to the fact that they're famished. I think they would eat just about anything at that point, and they tend to make poor choices because they are so hungry. They also eat too much and then aren't so hungry when it comes to dinner time. To keep them from consuming an entire package of licorice (yes, one child did this), I try to have healthier alternatives on hand. Each of these is a favorite and, yes, there is a pizza theme running through - what kid doesn't love pizza? Graham crackers are a terrific source of 'hidden' whole grains. Kids don't have any idea they're better for them and topped with fruit spread and low fat cream cheese they have just the right combination of whole grain and protein to make the perfect after-school snack. They also taste just like fruit cheesecake! Use whichever fruit spread you like and complement it with fresh fruit of the same type, or switch it up by adding a different fresh fruit to the top. 1. Combine cream cheese and fruit spread and stir until smooth. 2. Spread on graham cracker halves and top with fresh sliced fruit if desired. 3. Refrigerate for up to 1 hour, lightly covered. An old snack standby in our house is packets of cheese and crackers. The kids love them but they can get expensive and there are usually too many preservatives for my liking. Making my own is not only economical, but healthier as I can control the fat content and the amount of preservative the kids are getting. Whip up the cheese ahead of time and spread it for the kids or let them do it themselves with a safe knife. 1. Combine cream cheese and cheddar in a blender with milk and pulse until very smooth. 2. Stir in salt and paprika to taste. 4. Serve immediately or store cheese covered in the refrigerator for up to 3 days. Little nuggets of energy never tasted so good! Change the add-ins to anything you'd like in the same amounts listed and customize to your liking. You can also roll these in coconut for extra texture. 1. Blend together peanut butter, honey, vanilla extract and ground cinnamon until smooth. 2. Pour in oats, rice cereal, seeds and cranberries and mix until coated well. 3. Refrigerate for 1 hour and roll into one-inch balls. 4. Put into an airtight container and refrigerate for up to 2 weeks. Kids love pizza, and these crackers are a great mini-version for after school snacks. Add whatever toppings you like, broil for a few minutes and you're good to go! 1 cup toppings such as, olives, broccoli, peppers, ham, pepperoni, sausage etc. 1. Preheat broiler and lay crackers on a baking sheet. 2. Top each cracker with sauce, cheese and desired toppings. 3. Broil 3-4 minutes or until cheese melts. 1. Cut pitas in half crosswise, making 2 pockets each. 3. Microwave for 30 to 60 seconds for 2 halves, checking after the first 30 seconds. 4. Cool briefly if necessary and serve. Chayote squash (also known as mirlitons) are similar to other summer squashes, with a tender inside and edible skin. They can be found in most any supermarket these days as can quinoa, a grain from South America and the highest protein grain one can find. The bright flavors of Italian Parsley and orange play well with the mellowness of the squash. Serve 2 squash for a vegetarian main dish or one as a side to grilled chicken or fish. 1. Cut squash in half and cook in boiling salted water until tender - about 20 minutes.2. While squash are cooking heat Country Crock in a small pan and saute shallots and peppers until softened but not browned. 3. Add quinoa and stir well. Pour in stock and orange juice. Stir and cover tightly. Turn heat to a simmer and cook for 15 minutes or until all liquid is absorbed. 4. While quinoa is cooking and when chayote are tender, remove from water and drain well on paper towels. Remove seeds and most of flesh with a spoon, leaving a 1/4 inch edge all around the inside of the squash. Keep warm. 6. Stuff squash with quinoa mixture and serve immediately. Agua fresca is served at food stands throughout Mexico and is the perfect foil to spicy dishes. It's also one of the most refreshing drinks and excellent for cooling off on a hot summer day. 1. Remove rind and seeds from watermelon. Cut into cubes. 2. Peel cucumber and cut into chunks. 3. Puree fruit in a a blender until smooth - this can be done in batches if necessary. 4. Add water to fruit and stir well. Strain through a fine mesh sieve. little sugar is needed, use as you desire. While bruschetta is most often served as a savory preparation, it also makes a lovely and lighter dessert. The smooth cream cheese is a perfect contrast to the sweet-tart berries. Grilling is fairly quick and can be done on a traditional grill or in a grill pan on the stove top. 3. Brush each slice with butter and grill until lightly toasted on both sides. 4. 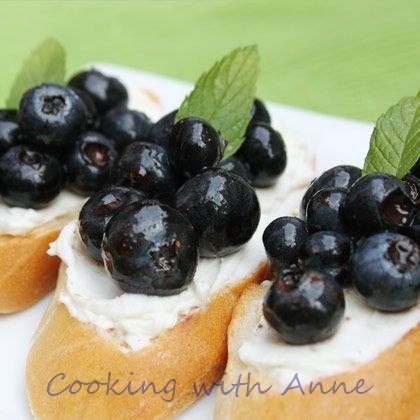 Spread cream cheese on each bread slice and top with a spoonful of blueberries. Garnish with mint if desired and serve. This is both a tribute and an homage to the now-closed Moravian Book Shop Cafe. I was recently in Downtown Bethlehem after not having been for several years and was surprised at the new shops, the old ones that were still there, and the ones I loved that are now gone. My oldest daughter and I went into the Book Shop fully expecting to have coffee in the back at the Cook Shop, but found ourselves instead at the Colony Meadery. As intrigued as I was, (and still am, and plan to purchase several types of mead there in the near future) I had a moment. It's like that moment when you realize your prized stuffed animal that you've had since you were a wee child has gone missing. I didn't cry, though I truly felt as though I might. I adored that place so much. Not only did I spend many hours there with my mother when I was a child, all of my children have had lunch there with me at one time or another. In fact, this was where I took each of my girls for "just us" lunch dates where they had my undivided attention. This is also where I sat with Kathy Lauer-Williams of the Morning Call for my interview that led to a half-page article about my time blogging with Disney. I could write on and on about this, but I won't. I will share with you my recipe for the melt I had there each and every time I visited. Summer vegetables are something we look forward to each year and this melt is full of garden-fresh goodness. Topped with cheese and only lightly cooked, the vegetables retain their crispness and the herbed mayo adds a layer of flavor underneath. They may look very 'handy' but a knife and fork is in order for eating them. shredded carrots and 1/4 cup shredded cheese. 3. Microwave on 50% power for approximately 2 minutes, or until cheese is just melted. degree oven until cheese is melted. I don't usually serve warm soups in the summer, but once in a while a day will present itself cooler than usual and then I feel comfortable serving this one. The bright flavors of dill and lemon complement the shrimp well. This can be served as a first course or as part of a light lunch. 1. Heat stock to boiling in a medium stock pot. shrimp atop each bowl of soup. My kids love fruit and grain bars for after school snacks, but they can be quite pricey. This homemade version is a substantial savings over the store-bought kind, and because they're made at home, I'm more aware of exactly what's going into them. Try an organic cake mix and organic fruit spread. Don't be tempted to add more fruit spread, the amount called for is just right and too much will make the bars difficult to cut. 2. Add egg and melted butter and stir with a wooden spoon until combined. 3. Divide batter in half and spread half into bottom of a greased 9x13 inch baking pan. 4. Spread fruit spread on top of crust to the edges. 6. Bake at 350 degrees F for 30 minutes or until top is golden. 7. Cool well and cut into 20 bars. I love bruschetta in just about any form and topped with artichoke is one of my very favorite. One made with pantry ingredients is even better. This one goes together easily with ShopRite Imported Artichoke Hearts, ShopRite Diced Tomatoes and a few other pantry ingredients to make one fabulous topping. Eat as-is with crusty bread or add to grilled chicken, fish or pork. Any way you serve it, it's sure to be a delicious addition to your pantry staples recipe repertoire! 1. Drain artichoke hearts and tomatoes. Chop artichoke hearts well. 2. Combine remaining ingredients, tasting for seasoning - only add sugar if necessary. 3. Refrigerate for at least one hour to let the flavors develop before serving. There's nothing quite like a fresh lobster roll on the shores of Maine, but when you can't get there and you can't afford lobster to make them at home, shrimp makes a delicious second-best. Bright lemon zest and parsley combined with creamy mayo and spicy Old Bay are a most delectable way to serve up these shrimp rolls for a light lunch. The mayo in mine is decidedly heavier-handed, but that's only because I have a few mayo addicts who wouldn't eat them any other way. Add mayo a tablespoon at a time until you find the consistency that you like. 2. Remove shells from shrimp and cut meat into chunks. 4. Spoon into rolls and serve. It's closing in on school time and thoughts of packing lunches are upon us yet again. Before you purchase store bought hand pies for your child's lunch, give these a try. Not only can you choose what type of apples you really like and how much cinnamon you prefer, you totally are in control of the sugar content. Every mom likes that! until doiugh forms. Flatten into a disc and wrap in plastic. Set aside in the refrigerator. until apples soften, about 5 minutes. from the apples begin to thicken, about 5 more minutes. 4. Remove apples from heat and stir in cinnamon. 5. Let dough stand at room temperature for 10 minutes. Roll dough to 1/8-inch thickness and cut into 12 rounds with a 4-inch biscuit cutter. 7. Cut a small slit in the top of each pie to vent steam. Brush on tops of each pie. completely before storing in the refrigerator for up to 5 days. Labor Day in the United States marks the last of the "Red, White, and Blue" summer holidays, and these recipes are perfect when entertaining even the most patriotic of people. Sweet blueberries and tart lemonade meet to make a very refreshing summer drink with patriotic garnish perfect for summertime Red, White, and Blue holidays. 1. Combine 1 cup water, sugar and 1 cup blueberries in a small saucepan. to soften and leach their color. 3. Strain blueberries and cool the sugar water mixture. 5. Serve with the extra cup of blueberries, the starfruit, and strawberries for garnish. You can freeze blueberries as well to help keep drinks cool. just the right touch for any Red, White, and Blue party. 2. Cream together butter and salt. Add shredded cheese and blend well. 3. Stir in flour with a wooden spoon or hands until a stiff and smooth dough forms. 5. Mix together oil and paprika. 6. Set crackers on an ungreased baking sheet and brush half of the crackers with the oil. Bake for 8-10 minutes being careful not to overbrown. 7. Cool completely and store in an airtight container. Eat within 1 week. blended with bacon and horseradish make this one delicious dip. Serve with Cheddar Stars. 1. Combine all ingredients and chill until serving time.